Before considering buying the perfect door for your house, a few things need to be considered. 1 Window Lite Glazed section with various types of glass or acrylic to allow for light and visibility. 2 Sections Steel panels reinforced with stiles interconnected with hinges and rollers. 3 Bottom Bracket A structured support that provides for attachment of lifting cables. 4 Cable Drum Grooved drums on the torsion spring shaft that allow lifting cables to wind when garage door opens. 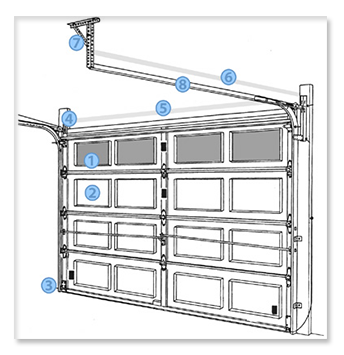 5 Torsion Springs Provides the means to raise and lower garage doors via cable winding on drums. 8 Track Guides a section to raise or lower g arage doors.